One of the concerns with ketamine is the rare occurrence of laryngospasm. Can EMS manage the airway without paralytics? If we can find just one bad outcome,should we prohibit EMS ketamine use and thus prevent all of the good outcomes, just to be safe? Let’s look at an actual example, rather than waxing philosophical. We report what we believe is the ﬁrst case of laryngospasam associated with prehospital administration of IM ketamine to a patient in excited delirium. Is one case in the US the tip of the iceberg, or just the rare occurrence of a rare adverse effect? In the US, ketamine is being used in some systems, but it still appears to be uncommon. Outside of the US, ketamine is much more commonly used. Ketamine is also one of the most widely studied medications available. If this were common, or even just uncommon, rather than rare, we would have many reports of laryngospasm. A ≈100 kg patient was given 5mg/kg (500 mg) of ketamine by IM (IntraMuscular) injection for apparent excited delirium. Within 3 minutes, he was not resisting and in a dissociated state. This is not as fast as in the movies and wrestling with an excited delirium patient for even a few minutes can be exhausting, but this is much faster than we should expect from any other IM medication (except maybe succinylcholine). Heart rate 101, room air oxygen saturation 98%. En route an IV (IntraVenous) line was started and oxygen by face mask was applied. Seeing a patient go from violent to sedated in a short period of time, especially with large doses of midazolam (which is known for causing respiratory depression) can make this appear to be the right thing to do, but we should be guided by our assessment. At the ED (Emergency Department) the vital signs were – blood pressure was 137/87, heart rate 82, respirations 18, temperature 36.8°C, and oxygen saturation of 100% on 15 LPM (Liters Per Minute) oxygen by mask. Approximately 5 minutes after arrival at the ED (12–15 minutes after ketamine administration), he became cyanotic. Repeat of the primary survey was notable for new upper airway obstruction, as well as absent breath sounds despite visible chest and abdominal movements that were felt to be consistent with attempted inspiration. Some paramedics will say, It’s not my patient and not my problem. These paramedics are much more dangerous than any side effect of any drug we might give. They just don’t care. Some hospitals may have specific policies about what we may do to treat patients in the hospital, but we can always reassess the patient and point out what was similar and what was different before we got to the hospital. I have only been criticized for hooking an unstable patient up to the hospital monitor by people who think that a hospital gown is more important than the patient condition. And I ask, if there is someone in the room, before I do something. Would you like me to bag the patient? The less stable the patient becomes, the more important clear communication becomes. Oxygen saturations were 20% on non-rebreather mask, with a good waveform. Head tilt/chin lift with two nasal airways was unsuccessful in clearing the obstruction. 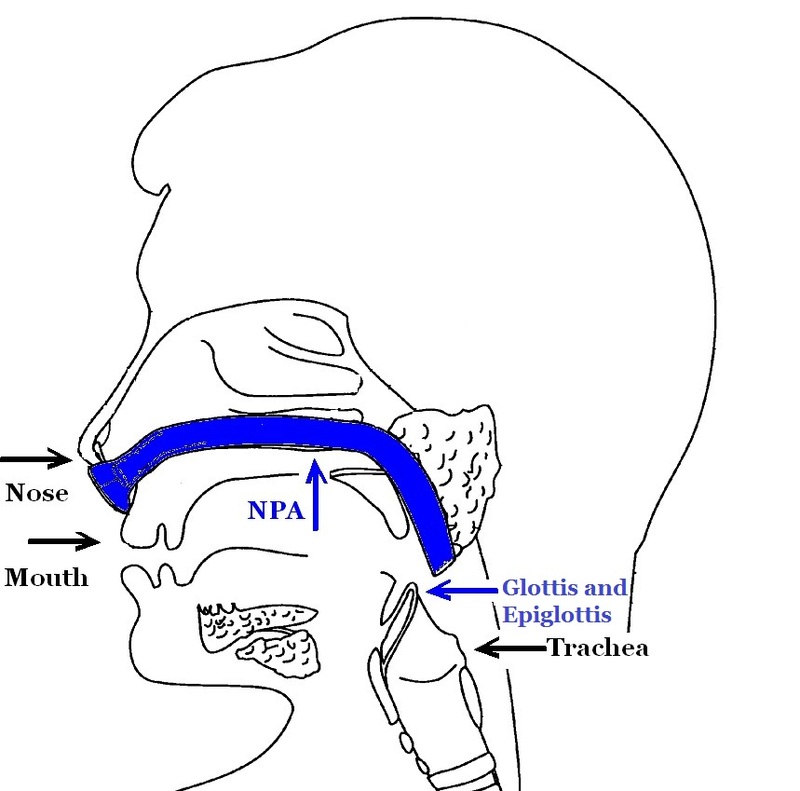 Would nasal trumpets (maybe expected to reach as far as the epiglottis) resolve an airway problem that is beyond the epiglottis? That does not mean that it is wrong to attempt less invasive means of oxygenation, but that we should not be too optimistic about the outcome of these treatments. They can certainly contribute to making a diagnosis. A diagnosis of laryngospasm was made, and positive-pressure ventilation with 100% oxygen via bag–valve–mask was initiated. The patient’s O2 saturations rapidly improved to 98% and breath sounds were heard bilaterally. 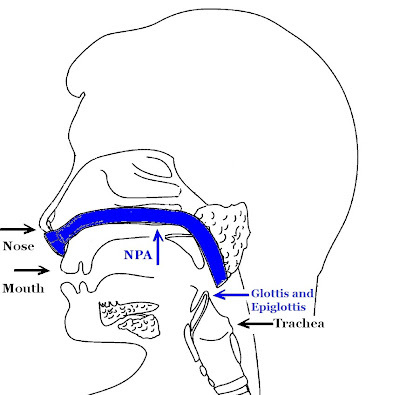 Assisted ventilation was discontinued and the patient was able to maintain a patent airway. Actually, not remotely All better! To be continued in Part II. Laryngospasm and hypoxia after intramuscular administration of ketamine to a patient in excited delirium. Burnett AM, Watters BJ, Barringer KW, Griffith KR, Frascone RJ. Prehosp Emerg Care. 2012 Jul;16(3):412-4. Epub 2012 Jan 17. It seems EMS and the actual roll out of new ideas and generalized progress is slower than congress.